To preserve, foster and perpetuate traditional customs and culture of our Swedish heritage, in particular, as well as that of other Scandinavians. To promote a spirit of kinship among the Swedish American community in the Greater Grand Rapids and West Michigan area. To create an awareness and appreciation of our Swedish heritage amongst the younger generation. To create an awareness of modern Sweden and its many contributions to our country and the rest of the world. In the spring of 1997 Doris and Clarence Anderson, who had moved to Michigan from Chicago where they had been very active in the Swedish organizations, gathered a group in their home to discuss the formation of a Scandinavian Society in the Grand Rapids area. Bill and Connie Carlson, Mark and Trix Carlson, Lars and Anita Nordell, and Dale and Cyndi Nelson were present at that first meeting. The decision was made to contact as many people as possible in the Scandinavian community in West Michigan. An organizing meeting was held in June and a record number of Swedes and Swedish descendants showed up. 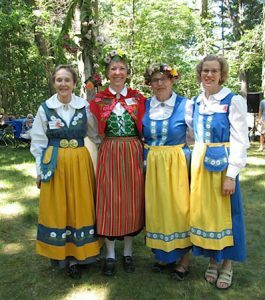 Subsequently the Swedish American Heritage Society of West Michigan was founded and immediately joined the Swedish Council of America. It is one of the largest Swedish groups in the country with close to 400 members. Mary Seeger and SAHS Past President Kerstin Trowbridge are current SCA board members. Valborgsmässoafton: In Sweden Valborgsmässoafton is celebrated on the evening of April 30th, but SAHS usually has its get together on the first Saturday in May. We light the traditional bonfire, join in choral singing and delight in the fact that this evening marks the end of winter and the coming of spring. Midsommar: The summer solstice, the longest day of the year, is celebrated on the weekend closest to June 24th. 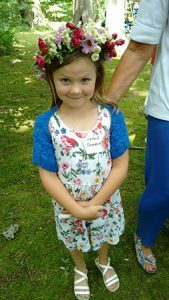 We decorate and dance around the maypole and feast on pickled herring, new potatoes and strawberries. 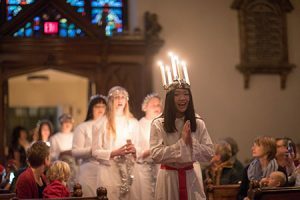 Lucia: Lucia day is on December 13th, but we usually celebrate it on the first Saturday of the month. Lucia brings us the light of faith and goodwill and the promise of the sun’s return. The SAHS Lucia procession is a grand and very popular event. Find out more about SAHS’ special events on the Upcoming Events page.